Conspiracy theorist Alex Jones has been banned from multiple social media platforms in the past few weeks. Conspiracy theorist Alex Jones has temporarily lost some Twitter privileges over breaking the site's rules against abusive behavior. Last week, the company was a notable exception after a wave of other major tech companies banned Jones and his main channels. The penalties to Alex Jones' personal account, @RealAlexJones, are for one week. The Twitter page for his website Infowars posted screenshots of the notice that Twitter apparently sent Jones. During this time, Jones cannot send tweets or retweets. He can still send direct messages to people who follow him and can browse the site. Twitter is citing Jones for a tweet linking to a live video of Jones talking about "web censorship." The video has been taken down, but in a clip posted by the liberal media watchdog group Media Matters, Jones says, "Mainstream media is the enemy ... but now it's time to act on the enemy before they do a false flag." He mentions taking action in courts, among other things, and says, "People need to have their battle rifles ready." In the tweet of the citation posted by Infowars, Twitter explains that its users "may not engage in the targeted harassment of someone, or incite other people to do so." A Twitter spokesperson told NPR that Jones' account currently has limited functionality. 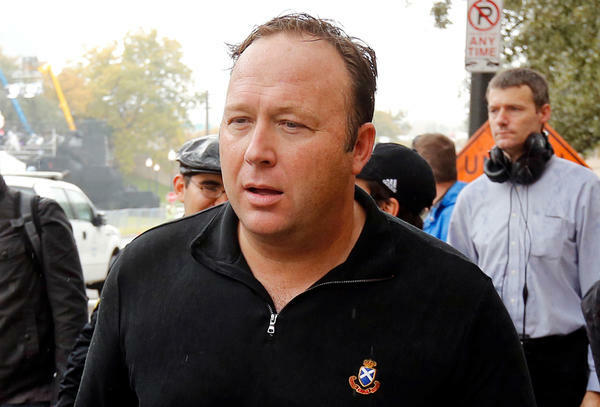 In the past few weeks, YouTube, Apple, Facebook and Spotify have banned Jones' main platforms over concerns about his content. Last week, Twitter CEO Jack Dorsey said, "He hasn't violated our rules. We'll enforce if he does." As NPR's David Folkenflik has noted, "The ideas that Jones shares are particularly noxious, the idea that Sandy Hook massacre of schoolchildren was a hoax, the idea that 9/11 was an inside job, and other things." The conspiracy theorist faces five defamation lawsuits, as NPR's Bill Chappell and Anastasia Tsioulcas reported, including three from the families of Sandy Hook victims. In a video released Wednesday morning on Infowars, Jones describes himself as the victim of a "mob." "This is all just about people exercising their power to bully people, this is really crazy," he said. Major tech companies have faced criticism for providing a platform for false news reports, particularly in the lead-up to the 2016 election.